It's always fun to sneak a little learning in when your preschoolers think they're simply playing a game! 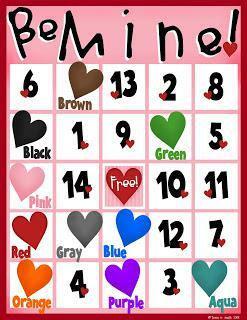 That's why we love this printable Valentine's Day BINGO game created by Tricia of Prepared NOT Scared that will have your kiddos reviewing colors and numbers 1-14 as they play! With it's cutesy clip art and colorful design, this would make an awesome addition to you holiday party plans and we're certain your kiddos will have a blast with it! The FREE printable set includes 24 unique game boards as well as calling card prints that can be cut out and placed in a cute basket. Easy peasy, right?! For the full game download, be sure to visit Prepared NOT Scared!